Visitors to the Tiburon shoreline may notice a new addition to the seascape — a five-foot tall, bright yellow buoy anchored just offshore San Francisco State University’s Estuary and Ocean Science (EOS) Center. 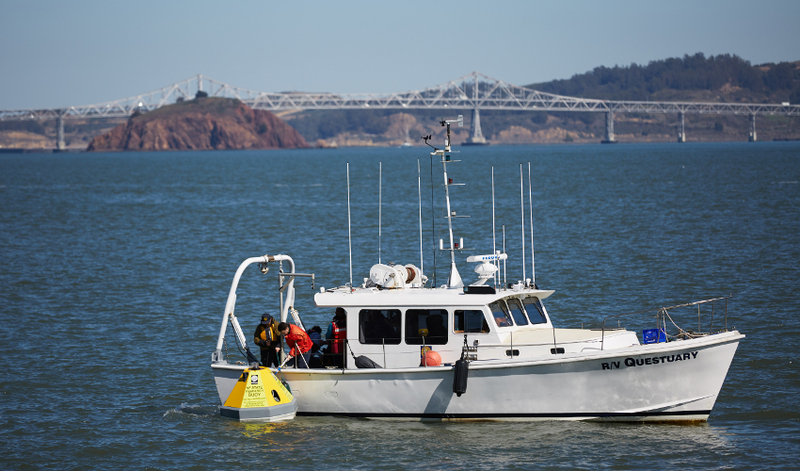 The Bay Ocean Buoy (BOB) and its companion mooring for Marine Acidification Research Inquiry (MARI) bring together researchers at SF State, the University of California, Davis and several other partner organizations and funders. It represents the first effort to perform long-term scientific monitoring of ocean acidity and carbon dioxide in the waters of the Bay. Waters from the Pacific Ocean and the Sierra meet in San Francisco Bay — and in terms of pollution, the focus traditionally has been on the water brought to the Bay by rivers and runoff from the land. However, deep cold ocean waters that upwell along the California coast may bring their own issues. A portion of the carbon dioxide released into the atmosphere by burning fossil fuels is absorbed by the world’s oceans, making them more acidic. This acidity has the potential to affect a variety of marine and estuarine life, particularly animals like oysters and mussels that build their shells from calcium carbonate. “Eventually we will have a finger to place on the pulse of major chemical changes that we expect are happening in San Francisco Bay in response to global environmental changes in the ocean and watershed,” says John Largier, a UC Davis Professor of Oceanography in the Department of Environmental Science and Policy and Associate Director of the Coastal and Marine Sciences Institute. To track these changes, the newly deployed BOB and MARI moorings carry sensors for measuring carbon dioxide in the atmosphere and the water, dissolved oxygen, pH, chlorophyll-a (a measure of the amount of microscopic algae in the water), water clarity, temperature and salinity. The sensors will make measurements at the surface and deep in the Bay where ocean waters flow in. The moorings are intended to be long-term additions to the shoreline. Along with providing an immediate snapshot of water conditions, the data they collect will let scientists assess how changing ocean waters are affecting the long-term health of the Bay. They’ll also assist in tracking the success of efforts to manage local water quality and to conserve and restore natural habitats. The project is funded by the U.S. Environmental Protection Agency through the San Francisco Estuary Partnership and by the Central and Northern California Ocean Observing System (CeNCOOS), a regional association of the National Oceanic and Atmospheric Administration’s (NOAA’s) U.S. Integrated Ocean Observing System. The Carbon Group at NOAA’s Pacific Marine Environmental Laboratory also contributed time and expertise. This initiative adds new capabilities to the network of shore stations supported by CeNCOOS.